There are many elements that go into the success or failure of a good role-playing game. At its roots, a good video RPG is one that can bridge the gap between the freedom of storytelling in traditional pen-and-paper models, and the immersive qualities of digital media built around a preprogrammed computer gamemaster (combat AI, pre-generated worlds, non-playable characters, etc). Japanese RPGs typically sacrifice open-endedness in favor of a moving storyline and characters whose roles the player assumes directly. 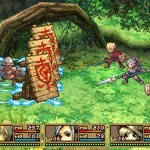 However, there have been exceptions to this rule, and I have found that to be the case with Radiant Historia.This game is developed by ATLUS, a company that has done much to break through typical role-playing formulas and designs and is constantly reinventing methods for creating an immersive RP experience.In Radiant Historia, the player takes the role of Stocke, an intelligence agent who seems at first glance to go through the motions of a typical RP storyline: he’s given a pair of allies and orders to find and rescue a person important to the war effort, and then he’s sent on his way, sword and shield in hand. They travel on foot, fighting a few baddies along the way until they reach their objective. But then things start to go south very quickly. With little to no control of the situation, the player is forced to endure an unavoidable defeat at the hands of the invading army, with the party completely and utterly overpowered before the storyline has even begun. It’s only a short time later, when Stocke is saved by the guardians of Historia and given the powers of time travel, that the player realizes there is no simple storyline or predestined hero out to save the world. Instead, the only way to move forward is to dive into the past, using the White Chronicle to take Stocke to different points in the timeline and make alternate decisions to change the course of events. The primary mechanism of time travel is reminiscent of choose-your-own-adventure books in its execution. The post-prologue game begins with a major decision to be made by the player, the result of which will branch the timeline into two distinctly separate ones. As the player goes down one path, other important decisions create smaller branches and alter the future course of events. Some decisions lead to one of many possible bad endings, while other decisions succeed in advancing the story. Further still are the decisions that affect the outcome of events in the alternate timeline, which come into play when Stocke cannot advance because an event in the past failed to occur and must be initiated in the alternate timeline. As in many other RPGs, characters level up with combat experience, gain new abilities and increases in stats, and obtain upgrades to their weapons and equipment. One of the fortunate aspects of the game is that time travel has no effect on leveling, with all characters retaining the current experience levels across different timelines and points in history. This makes returning to an earlier point in the timeline during a particularly difficult boss battle much easier to overcome as the game progresses further along. The player controls Stocke as he travels from one location to another, which is strictly determined by the current objectives in a particular timeline. This means that there are some areas that will be open to explore, but others that will be closed unless required by the storyline. 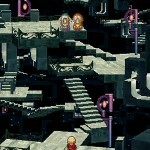 When in a given location, the player can freely engage or evade enemies encountered on the way to Stocke’s objectives. The combat situations in the game take place on a field that is divided into three-by-three grids, with both parties arranged on the grids beforehand. Characters fight more effectively at closer ranges but sacrifice defense in doing so; therefore, characters focusing on attack power are usually placed in the front, with magic-users placed in the rear. Characters typically wield abilities and magic spells containing very specific areas of effect, which makes grouping enemies into ideal grid locations using specialized “push,” “pull,” and “knockback” skills an important strategy for victory. Additionally, the turn-based mechanics are modified in a way that allows members in a party to act all at once, attacking the same enemy or group of enemies one after the other and increasing the damage output with combo hits. There is even an option to change the order of turns between characters on the fly, or to allow the enemy to go first in exchange for more party turns on the player’s side. 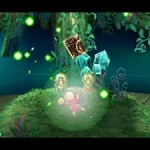 The enemy AI will often utilize similar tactics to defeat the player, so careful and sound plans of attack must be made to gain the advantage in combat. Fortunately, characters are allowed to retreat from combat in order to regroup and rethink strategies, even during boss confrontations. In total, these combat mechanics are very solid and relatively easy to use, for both novice and pro RP gamers alike. The game’s fantasy setting really comes to life with the help of detailed visuals, enchanting music, and memorable characters. Much of the realm of Vainqueur is consistent with the exchange between the lighter and darker elements of the game. Alistel is portrayed as a smoky, dirty, Industrial Era capital populated with destitute but patriotic citizens who support their small but technologically superior military. To the west, Granorg is a majestic, shining empire of nobles and gentry, well-maintained parkways and fountains, and clean streets. But hidden just beneath the surface is a festering discontent towards the ruthless autocracy, where hungry, starved peasants are left for dead in alleyways and sewers. Yoko Shimomura, made famous by her musical work on the Kingdom Hearts series, shows a surprising aptitude for developing an emotionally-moving fantasy genre soundtrack in Radiant Historia. In much the same tradition as her previous works, Shimomura captures the emotional tensions and moods inherent in each location and situation. “Mechanical Kingdom” gives the impression of a realm seeped in intrigue and shadows, cold steel and concrete infrastructure, and a war-weary people. Granorg’s inherent pomp and rich history is put on display in the aptly-titled “Forever Proud,” a mood that seems to further emphasize the power and influence of the Granorg monarchy and its all-encompassing suppression of any threat to its supremacy. The various battle themes, like many of Shimomura’s previous works, invoke images of struggle and heart-wrenching anxiety, as well as the distinct dance-like quality of two opposing forces facing off against each other, each vying to take the lead. It’s no surprise that the unique rhythm of “The Edge of Green” makes the player feel like he or she has a real stake in the outcome, and that the player must outsmart and outfight the opposition to achieve total victory. In a way, this soundtrack is a culmination of Shimomura’s work up to now, and it is clear that she thoroughly enjoyed creating it. 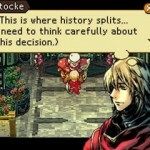 Although it is a fantasy tale at heart, Radiant Historia manages to comment on a multitude of real-world issues, including religious fanaticism, corruption in theocratic government, nationalist pride, racial and cultural prejudice, society’s impact on the environment, and the consequences of overdependence on finite natural resources. The story carries a lot of depth, to such a degree that replaying key moments in the plot’s “history” is just as enjoyable as the first play-through. The main characters are very memorable and have interesting backstories that are woven seamlessly into the story. Furthermore, the general lore of Vainqueur is very detailed and could even be expanded into a multitude of sequels or side stories, if the authors and creators so desire. An entire history of the realm spanning hundreds of years is referred to in many parts of the story, and the societies and kingdoms that Stocke and his allies visit are all equally interesting and unique. 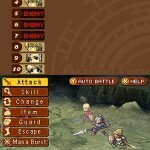 There are many elements that come together to make Radiant Historia a memorable, fun role-playing game. The mechanisms of moving forward, backward, and across timelines allow the player to explore the game in-depth and create new paths and endings. The combat system is intuitively easy to operate and more strategic than that of most other RPGs. The visuals are stunning, and the world is expansive and intriguing, making it enjoyable to explore and interact with characters again and again as the player repeats points in history. Shimomura’s musical talents shine through a moving, enchanting soundtrack that matches the different environments and situations encountered in the storyline. Stocke and his allies have a refreshing depth that is not often conceived in other fantasy games, and the story itself offers interesting dialogue on myriad real-world issues regarding humanity, the environment, and social justice. Radiant Historia is a solid, but unique addition to anyone’s library of role-playing games, and it is certainly worth trying out.